In this resource, we’ve done the research to help you find the best places to shop for mattresses in Nebraska. Are you wonder where to purchase a mattress in Nebraska? We have you covered. For far too many this purchase can be a nightmare, but not anymore. More so than ever mattress companies are looking to get a piece of the pie, and more so than ever the customer has the power. What that means is that most mattress stores can match prices and even beat them, carry a wide variety of quality mattresses and won’t pressure you to purchase. 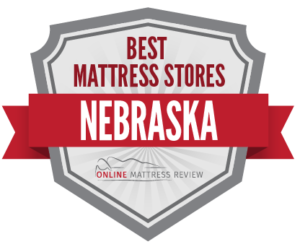 We looked through the top-ranked mattress shops in some of the more populated areas in Nebraska and only selected location that provided all of those qualities. Still can’t find what you need? We recommend shopping online. You can even do a little bit of both to guarantee the best buy. Take a look at what we determined to be the best mattress stores in Nebraska. Wondering Where can I purchase a mattress in Lincoln? We found some great spots. During our search we combed through the top-ranked mattress shops in the area and selected locations based on quality customer service, affordable mattresses, and a great selection. We also sought out locations that offered other conveniences like fast shipping options and reliable return policies. Here’s what we came up with. Lincoln Mattress and Furniture (4740 N. 27th St.) is a great place to try if you need a new mattress and more to furnish your home. The sales team are friendly and patient, and won’t push you to make a purchase. In addition to quality name brand mattresses you’ll also find beds, bedding, and more. Land and Sky (1401 W. Bond Circle) provides adjustable frames, natural latex mattresses, natural spring mattresses, mattress pads, pillows and more. If you are looking to sleep on an all natural mattress, head here. If you’re unsure exactly what you need from a mattress, head into Mattress Firm Lincoln (5001 O St. Ste F.) where you’ll find over 55 different mattresses from which to choose. Whether you like feathery soft or super firm, there’s something for everyone. This location shines with their knowledgeable and friendly sales team. For some of the best customer service practices in town head over to Denver Mattress (5000 N. 27th St.) where you’ll find a patient sales team that won’t pressure you to purchase. As with other Denver Mattresses, you are sure to find a great deal. We like this mattress store for anyone who is looking for a wide selection of affordable options. Wondering where to purchase an affordable mattress near Omaha? You could head over to the Mattress Firm Clearance Supercenter in Council Bluffs, IA. This is just over the state line, but we wanted to mention it as it’s close, convenient, the prices are fantastic, and the sales team are terrific. It may just be worth the trek! Omaha Mattress Company (8505 Giles Rd. Papillion, NE) is a great business. The staff are knowledgeable and courteous as are the owners. You’ll find memory foam, coil, plush and more for deep discounts. We recommend checking online as the company regularly offers 50% off their prices. Once your mattress purchase is complete, you may want to look into purchasing one of their hot tubs for relaxation to the max. Just a thought. In West Omaha there is a Lebeda Mattress Factory (14215 Q St.) where you’ll find a wide-range of mattresses . The sales team are great, in that they are knowledgeable and won’t pressure you into purchasing. Here’s a fun fact, Lebeda Mattress Factory has been in business since 1946! Omaha is a great place for affordable mattresses and expect to find some great deals at Crown Furniture Inc (8934 J. St.) where you’ll find a variety of mattresses and other furniture as well as a 90 day payment option. Mattress Firm Omaha Supercenter is the place to when you’re not sure exactly what you want. This location has as vast number of quality mattresses as well as a knowledgeable sales team and as with all Mattress Firms you’ll receive a 120 sleep night guarantee. Purchasing a mattress in Grand Island doesn’t have to be a nightmare. There are a number of quality mattress stores. We looked through a number of mattress stores in the area and selected locations that offered a good selection, and quality customer service. Our first pick for mattress shops in Grand Island is America’s Mattress (920 Diers Ave.) where you’ll find a wide selection of mattresses and a fun shopping atmosphere. We recommend shopping around online first before heading in as this location may do some price matching. If you like to try before you buy, head here and don’t be afraid to lay on every bed. Slumberland Furniture (3537 W. 13th St.) is a fantastic place to head for a mattress and more. If you are looking for a no-pressure shopping experience head here. You are free to browse and try mattresses at will. Additionally, the sales team are knowledgeable and friendly. So that’s our guide to finding the best mattress shop for your next mattress in the great state of Nebraska. We wish you luck on your search!